The Andean cat is said to be the rarest and least known of all cat species. It is about the size of a domestic cat but can appear larger because its long fur and tail. Its coat is striped and spotted and silvery-gray in color, and its underparts are paler in color. The fur is very fine, thick, and soft, and the tail is pale and marked with nine dark-brown bands. The ears are gray in color. Adults grow up to 24 inches long on average and reach a shoulder height of about 14 inches. The average body weight of adults is 12 lbs. Andean cats are found high in the Andes Mountain range in South America. They have been spotted in Chile, Argentina, Peru, and Bolivia in rocky treeless terrain, where the conditions are very dry, windy, and cold. Very little is known about its social and reproductive behavior, but it is believed that the species is solitary. Diet may consist of small mammals such as chinchillas and viscachas, reptiles, and small birds. Very few Andean cats have been observed in the wild and none are found in captivity. The current population status is unknown. Threats to the species may include poaching by locals, and some cats are killed in Chile and Bolivia because of local superstitions. Currently, the species is being studied by the Andean Cat Alliance and Conservation International with the use of radio-telemetry. Copyright Notice: This article is licensed under the GNU Free Documentation License. It uses material from the Wikipedia article "Andean mountain cat". Glenn, C. R. 2006. 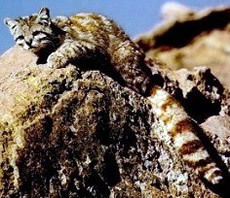 "Earth's Endangered Creatures - Andean Cat Facts" (Online). Accessed 4/19/2019 at http://earthsendangered.com/profile.asp?sp=57&ID=11. Need more Andean Cat facts?